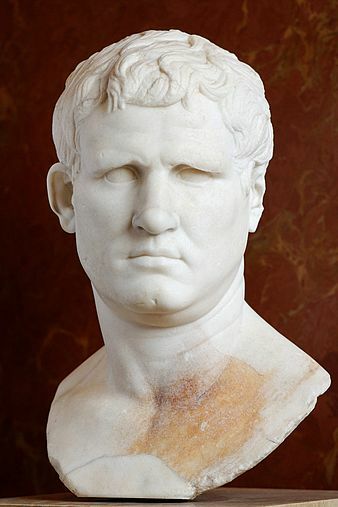 King Agrippa was the Jewish monarch. Agrippa’s territory comprised most of Israel, including Judea, Galilee, Batanaea and Perea. Agrippa (Marcus Julius Agrippa II – A.D. 27-100) was the son of Agrippa I (Acts 12:1-25) and the great-grandson of Herod the Great (Mt 2:1-23). He came to pay his respects to Festus, who was the procurator (governor) of Judea (AD 59 to 62). Agrippa was brought up in Rome in the court of Emperor Claudius. Agrippa had supreme power in Jewish religious life. The Romans had given him the right to appoint the high priest and custodianship of the temple treasure (Josephus Jewish Antiquities 20.213, 222). He was the last of the Herodian line. Accompanying him now is his younger sister Bernice. Earlier Bernice was engaged to Marcus, a nephew of the philosopher Philo of Alexandria. She then married her uncle Herod, king of Chalcis. After Herod’s death, she returned to live with her brother Agrippa II and engaged in an incestuous relationship with him. (Josephus Jewish Antiquities 20.145-46; Juvenal Satires 6.156-60). Did Much Learning Make Paul Mad? Today, we think that much learning points to an intelligent person. However, in Paul’s day, they had a different view of education. Festus boldly told Paul that he was over-educated. Festus made the charge that too much learning had made Paul mad or insane. What made Festus say that? Because of what Paul said in Acts chapter 26 verse 23: that Christ should rise from the dead. Festus had a hard time understanding the belief in the resurrection. Festus thought only a crazy man would babble about visions, revelations, voices out of heaven, and resurrections. While Festus had to acknowledge that Paul was intelligent, his Roman reasoning made it difficult to believe everything Paul taught. Festus’ interruption set the stage for what would become one of the most important conversations in history. The English word “soberness” is translated as “sophrosune” in the Greek language. The Greek prefix soph is derived from the word “sophia”, which means “wisdom”. It implies a “total control of the senses.” When Paul responded to Festus, he was speaking with full control of his senses. Paul had a sound mind that was used to proclaim the truth about the resurrection of Jesus Christ. In the next verse, Paul tells Festus that he is not mad. Paul declares he is of a clear mind and that King Agrippa knew he spoke the truth. “This thing” that Paul referred to was the death and resurrection of Jesus Christ. Paul said that “this thing was not done in a corner.” Most people of that day knew that Jesus had lived, died, and there was a claim to His resurrection. Paul was one of the most educated men of his day. Paul’s’ reasoning was brilliant. In his defense, Paul presented the gospel to Agrippa. Moreover, now in verse 26 Paul forces him to come to a conclusion that he probably wouldn’t have made on his own. He presents Agrippa as a silent witness to Festus. Even though the king had not said a word, his silence attested to the truth of Paul’s words. By his silence, the King was stating that the case is clear. Even the King believed in the prophets that told of a coming Messiah. Jesus of Nazareth was that Messiah. Here Paul is urging Agrippa to come to that conclusion. Paul skillfully was trying to persuade Agrippa that if he believed the prophets, he would have to believe Jesus is Messiah. Paul was saying to Agrippa – you know the truth! Paul attempted to make Agrippa responsible and to acknowledge that Jesus was the prophesied Messiah. Paul was trying to capture Agrippa’s will. Paul knew that Agrippa would not come to this conclusion by himself. Paul would need to give Agrippa a little push in that direction. Paul wanted Agrippa to make acknowledge that Jesus is the Messiah. Paul put Agrippa in somewhat of a bind. If Agrippa said, “I do believe the prophets,” then he would be admitting that Jesus is the Messiah. That would cause him trouble with the Jewish leaders. However, if he said, “I do not believe the prophets,” then he would be in even deeper trouble with them. So Agrippa was in a tight spot, he could not say yes or no. Verse 28 of Chapter 24, in the King James Version, is somewhat misleading to today’s English speakers. It does not accurately communicate what Agrippa said. The Greek text should be translated as: “In such a short time are you trying to convert me?” (NIV2011). Agrippa ignored the question. Acts 24:29 is a confusing verse. The English Standard Version (ESV) offers, what is the true intent: “Whether in a short or long time, I would to God that not only you but also all who have been with me this day might become such as I am, except for these chains.” It did not matter how long it took, Paul was trying to convert Agrippa and everyone else. Paul then adds that he wished they would be like him but without the chains. Wow – what boldness! Paul’s approach was direct but honest. He showed no bitterness over the situation. Paul took one look at all those so-called dignitaries and told them that he wished they were like him. They had everything the world had to offer but nothing that God had to offer. Jesus said, “What shall it profit a man, if he shall gain the whole world, and lose his own soul? Or what shall a man give in exchange for his soul?”(Mark. 8:36- 37). Paul might have been willing to die to save Agrippa’s soul, but he did not want Agrippa’s spiritual chains. That is the heart of Christianity. It is evangelism driven by the love of God for lost humanity. How could anyone resist that kind of message spoken with such concern and love? Paul was innocent. 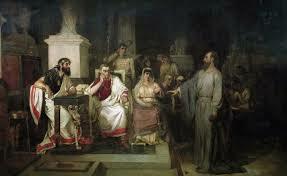 Both King Agrippa and Festus agreed Paul was not guilty. Paul was not an insurrectionist or a political traitor. To be a Christian is to have a spiritual relationship with the living God. True Christianity is guilty of nothing worthy of death or chains. Paul was judged innocent by this trio of sinners but what about their personal spiritual response? Although Paul had already “appealed unto Caesar”, Caesar had not heard a word about it. They could have let him go since there wasn’t any reason to let the appeal to Caesar go ahead. No appeal letters had been written. There wasn’t any case. However, Festus and Agrippa used the appeal as an excuse to shove Paul out of the way. Paul made both men very uncomfortable with his reasoning and logic regarding Jesus Christ and resurrection. They just wanted Paul gone! What was stopping King Agrippa and Festus? Paul was innocent after all. Why would they push the case to Rome, hiding behind Paul’s appeal to Caesar? Why? Because the most important thing to them was popularity and immorality. King Agrippa was a vile, self-centered, unbelieving, prideful, ignorant, and indifferent man. Which, by the way, are the same things that hinder other people from receiving Christ. Paul was not discouraged by the rejection of the gospel message. It did not matter to Paul if people believed him or not. They could curse him, but Paul would not change. When Paul finally arrived in Rome, the first thing he did was to preach Jesus, and Him resurrected. Paul had a passion and spirit could not be defeated. He continued to be faithful against all odds. Why? I believe it is because Paul served God and not man. He did not change because of the response of men. You see Paul had decided that it was not up to him to determine the outcome. Paul sometimes preached to great crowds, with no response. However, that did not change him. May we be like him. “Much learning” had not made Paul “mad.” Paul’s arguments before Agrippa, Festus and Bernice were so compelling that all Festus could do was to resort to name calling. Festus accused Paul of being “mad” or insane. However, Paul was not “mad”. Paul claimed to have been a student of the famous Jewish teacher Gamaliel. Evidence for this is found in the book of Acts. Gamaliel is reported to have offered somewhat lenient advice concerning the early preaching of the apostles in Acts 5:34-39. He said that if the movement is from God then it cannot be stopped if it is not then it will not succeed. However, it was not Gamaliel who taught Paul the most it was Jesus Christ. As Paul journeyed to Damascus, he was struck down by a bright light from heaven. A voice from heaven asked “Saul, Saul, why persecutest thou me? it is hard for thee to kick against the pricks.” Moreover, Paul said, “Who art thou, Lord?” And he said, “I am Jesus whom thou persecutest.” (Acts 26:14-15).